Heard your daughter or her friend say she doesn’t like technology? While 31% of teens call technology “fun,” that percentage is much lower for girls. It’s not because of aptitude. The reasons girls aren’t interested in tech tend to be environmental. Few parents want to limit their child’s options for careers. You want each child to find a place to thrive, mentally, emotionally and financially. But you need to know what discourages kids from getting involved in technology. And, if you’re working with your daughter or other girls, you’ll see these factors impact girls and minorities harder than boys. But that’s changing. Building robots and telling digital stories are some of the fun ways kids learn about technology, but many middle schoolers — especially girls — steer clear of these classes, per a new study. Some think it’s “boring,” and others think computers are just for boys. Others can’t find someone like them working in tech. It’s those types of notions keeping girls from pursuing technology as an interest or a career. 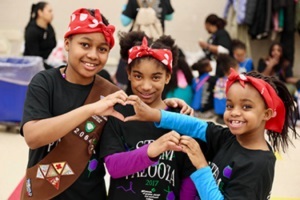 Eleven is the critical age when girls start to choose activities besides technology and science – so that’s exactly when groups focused on getting more girls in STEM jump in. Through mentoring, entrepreneurial projects and hands-on playtime, girls get a look at how much fun there is in technology, and how many career options are open to them, too. Parents play a critical role in helping kids embrace technology, too. That’s where Launching Your Teen’s Career in Technology: A Parent’s Guide to the T in STEM Education fits. Reference the book to explore how your daughter’s strengths and interests fit with tech careers. You can encourage girls to try activities that lead toward tech, and you can push your schools to change too. Right now, you can change a girls’ future – spend 10 minutes on CompTIA’s Dream IT site to find nearby programs that focus on bringing girls into tech. Get involved, and share the information with girls, teachers and guidance counselors. Read profiles of women in technology to your daughter. Get your copy of Launching Your Teen’s Career in Technology: A Parent’s Guide to the T in STEM Education at a 10% discount by entering the coupon code BLOG17 here. Special Correspondent Michelle Lange is a Chicago-based writer, designer and business owner, who developed graphics and provided photography for the “T in STEM” guide. I like how there are more emphasis on encouraging kids ad especially girls to concentrate on STEM. For years girls in particular were discouraged. Nice programs. Helping young women enter a career where they can succeed, no matter what industry is so necessary! I was also involved in this book project, because I am passionate about providing resources that help support young women. This book is a wonderful tool for parents to support their children (of whatever gender!) in pursuing a field that can be creative, hands on, widely varying, and always engaging, but is sadly undervalued. It's so important to teach young girls that they can do anything that interests them and not to pay attention to stereotypes!